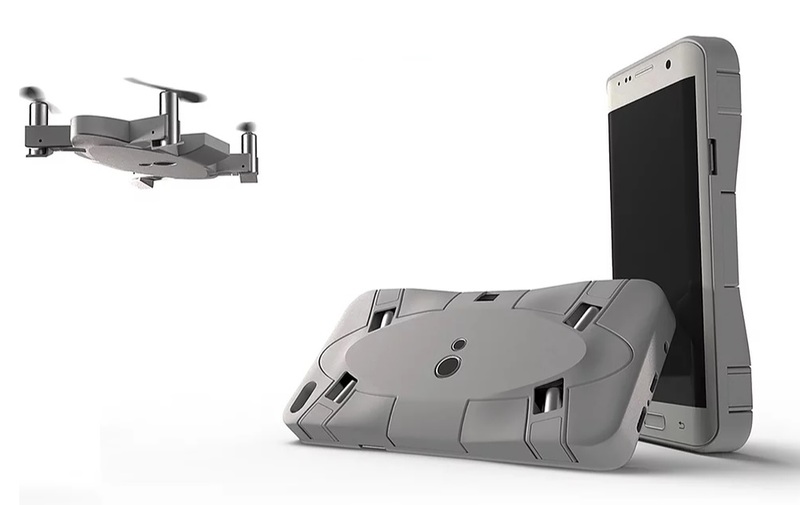 This smartphone case is designed to convert to a drone in a few simple steps. You can now carry your drone with you wherever you go. That’s starting to change, however, as drones are now coming in a variety of forms designed to fit a variety of lifestyles. SELFLY is an autonomous flying camera drone that also doubles as a phone case. When the drone is in place, the phone can be slipped into and out of most pockets. During actual use, the drone can take off and land in the palm of the user’s hand. Intended to be like an invisible tripod, the device hovers autonomously in the air while waiting for orders from the user on what to do. The drone serves as a remote eight-megapixel camera that captures videos at 1080 pixels and 30 frames per second. Device owners can guide the drone with stick controls, or there’s “fly by picture” mode which has the drone film by passing in front of the user. As the drone films, the HD video is recorded to RAM on SELFLY and is stored as raw data. The live video stream sent to the user via Wi-Fi is relayed as lower quality video. Once users confirm they’re happy with a shot, they can take a high-resolution photo that is immediately transferred to the phone. High-quality video can be sent to the phone later on depending on the levels of available bandwidth. Due to the small form factor (a weight of 70 grams and case sized at 9 millimeters), SELFLY only has a 640 mAh battery that lasts for approximately five minutes. Since there’s no inductive charging technology, SELFLY can’t receive power from the smartphone. It instead requires a separate Micro USB port for charging. To help make the technology more accessible the makers of SELFLY are planning to open source the source code of the user application. It’s worth noting that the creator of SELFLY isn’t a technologist himself. Hagay Klein originally was an orthodontist for ten years while being a tinkerer who has an extensive interest in model aircraft. This is reflected on his company website where he alludes to the Apollo 11 spacecraft which had less power than smartphones today. So far the makers of SELFLY have raised over $268,000 via their Kickstarter campaign. Pricing for the device starts at $99 for a camera kit. This includes a universal connector for all 4.6-inch mobile phones such as the iPhone 6, iPhone 6 Plus, iPhone 7, iPhone 7 Plus, Galaxy S6 Edge, Galaxy S6, Galaxy 7, Galaxy 7 Edge, and Nexus 6. The expected retail price is $139. Gadgets, people love them. That is what drives campaigns like this and if you can sell it to QVC, you are really going to be making money! If this product was more universal with other phones I would say home run, especially for the athletes out there. But until then, its just another gadget with a short battery life. This product support any 4-6 inch phone with a universal notebook case. There is special case for top sellers models but the universal support all. There are a few things that I noticed for this campaign and why it might have been so successful. For one, the $99 price tag is going to get eaten alive by consumers! Get a good price and things will go great for your company! That price is where it is at for the company. If this thing costs even $50 more, it would not be as successful IMO.